Ostrich can’t fly, they have huge bodies, and tiny wing muscles, until now! Fly! Ostrich from iToyToy is an iPhone game where you play an Ostrich who want so badly to fly, that he’s doing anything it takes, including and not limited to strapping himself with rockets, using gliders and more. 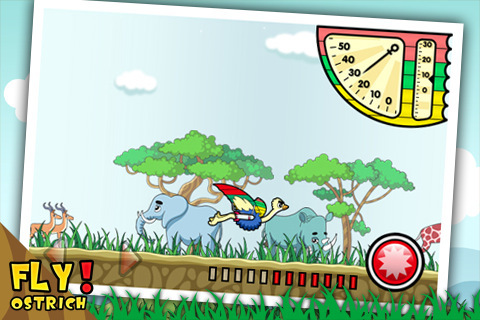 The game starts out with your Ostrich taking dives off a platform and falling to the ground shortly after, although he earns some money for each flight. The longer distance, and higher elevation you fly, the more money you earn. You also make money for going faster as reaching MPH targets get you cash. Finally the length in seconds of your flight is used as a bonus earning category. As you earn more money, you buy accessories for your guy to help him fly longer and also spend game cash on increasing the Ostrich’s skills. Things you can buy are like Gliders, Rockets and improvements are for Ramp Height, Acceleration, Air Resistance, Rocket Fuel and more. 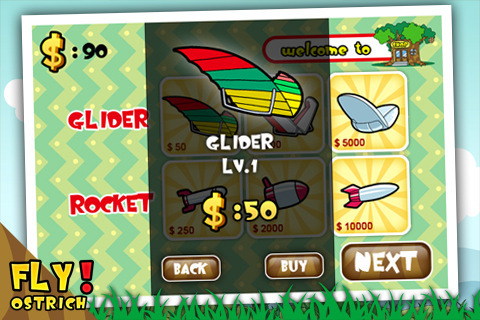 There are 3 levels for rockets and 3 levels of gliders you can upgrade, and 10 levels for each improvement. Once your finish all 4 goals per mission (time, distance, elevation, mph) the next level unlocks. The paid version of the Fly! Ostrich app comes with 20 levels. A free version is available which has 8 missions only and has ads inline as well. The only control you have is a tilt control, which you can change a few seconds after you big bird takes flight, to either tilt him up or down. Fly Ostrich is a really addictive game and you can get hooked pretty quickly. It has a pretty high cute factor as well, like Angry Birds, with the poor Ostrich guy getting knocked down and getting back up to try again each time. You really just want him to fly, and do well. Graphics are hand drawn and super clean, and a comical soundtrack makes the whole thing come to life. A wonderful little time waster app. Sample the lite version of Fly! Ostrich – 20 mission on your iPhone for free. AppSafari review of Fly! Ostrich – 20 mission was written by Joe Seifi on January 4th, 2011 and categorized under Adventure, App Store, Featured, Free, Fun, Games. Page viewed 3358 times, 1 so far today. Need help on using these apps? Please read the Help Page.